…so beginnt sie einen Krieg? Wenn die Regierung die Proteste im Land nicht unter Kontrolle bekommt, so eine alte Wahrheit, so beginnt sie einen Krieg. Es ist zu hoffen, dass es soweit nicht kommen wird. Doch ob beabsichtigt oder nicht – die Logik, dass man Protesten den Wind aus den Segeln nimmt, wenn man einen äußeren Feind findet, greift derzeit in Ägypten ebenso wie in Israel. Am Donnerstag haben vermutlich radikale palästinensische Gruppen bei einem Anschlag auf einen Reisebus im israelischen Ferienort Eilat 8 Menschen getötet, sie waren, wie es scheint, über Ägyptens Sinai-Halbinsel nach Israel gelangt. Bei der Jagd auf die Täter ist die israelische Armee Angaben von UN-Friedenstruppen zufolge auf ägyptisches Territorium vorgedrungen und hat dabei 5 ägyptische Grenzpolizisten getötet. Die Medienberichte liefern widersprüchliche Berichte, ob dies von einem Flugzeug aus oder am Boden geschah. Israel sowie zahlreiche internationale Quellen machen die prekäre Sicherheitslage auf der Sinai-Halbinsel mit für die Anschläge verantwortlich. Die europäischen Medien sprechen nun von der „schwersten diplomatischen Krise“ und einer „Eiszeit“ zwischen Ägypten und Israel. Derweil bombardiert Israel Ziele im Gazastreifen, mindestens 15 Menschen kamen ums Leben, Zeitungen sprechen von der Angst vor einem „dritten Gazakrieg“. 2 billion $ from the Worldbank??? In June Egypt refused after weeks of discussion to take a US-$ 2 to 3,5 billion loan from the International Monetary Fund (IMF) as incompatible with national interests. The government changed the budget and raised some taxes to be able to refuse the loan, also it accepted loans from Saudi-Arabia and Qatar (see old posts). Today the surprise: Egypt accepts US-$ 2 billion from the Worldbank, sister organization of the IWF. There was no big discussion about it so far. The money goes directly to the ministry of International Cooperation, part of it is granted, part loaned. US$ 250 million are granted for the ministry employees, 330 million to modernize a railway line, 100 million for an irrigation system. Further 600 million to finance a power station near Cairo and 220 million for a wind energy station at the Gulf of Suez. A loan of about US-$ 1 billion is further negotiated to support to power stations. In London, huge riots erupted Saturday night in the poor area of Tottenham after a 29-year-old man had been killed by the police. The riots spread to other districts of London Sunday night, more than 160 persons were arrested. „London’s Deputy Mayor Kit Malthouse blamed the violence on a relatively small number of criminals […]: „This is quite a small group of people within our community in London who … are frankly looking for stuff to nick (steal). They are picking particular kinds of stores, whether it’s because they want a new set of trainers or whatever,“ he told Sky News. 1. Protest, of course, are never done by protesters – as already Mubarak knew all protesters are always criminells/thugs. 2. Protest never have to do anything with the problems in the country or in the place where they take place, they are organized (!) by „forces from outside“ (SCAF) that want to destroy the country/city/district – and of course the always organize through twitter and facebook (and eat at Kentucky Fried Chicken). Have the read the last declarations of the SCAF? And have they seen where Mubarak is now? Erstens: Feier die Revolution und schimpfe auf den abgesägten Diktator. Du musst erklären, dass du die abgeschlossene Ära ganz und gar verurteilst. Natürlich hast du in Wirklichkeit noch immer Sympathien für den ehemaligen Diktator der jahrzentelang dein Freund und Kollege war, dennoch hast in die Öffentlichkeit zu treten und lauthals zu schreien: „Lang lebe die Revolution!“ Die Menschen werden dir spontan glauben. Niemand wird sich daran erinnern dass 40 Jahre lang an der Seite des alten Diktators standest ohne irgendetwas gegen die Verbrechen, die er begangen hat, zu sagen. Die Menschen werden dir glauben weil sie sich wünschen, dass du auf Seiten der Revolution stehst, und Menschen sind sehr anfällig dafür, dass zu glauben, was sie sich wünschen. Verfluch den Diktator allerdings nicht zu sehr, für den Fall, dass du doch Misstrauen erregst. Verfluch ihn nur einmal, zweimal, ja am besten zweimal, das wichtigste ist dass du unablässig die Revolution hochleben lässt. Die Menschen müssen aufwachen und ins Bett gehen zum Lobgesang der Revolution, erstens weil sie dann glauben die Revolution hätte gewonnen (auch wenn sie in Wirklichkeit keines ihrer Ziele erreicht hat), und zweitens weil so alles was in diesem Land danach passiert einzig und allein mit der Revolution in Verbindung gebracht wird. Many were skeptic till the last moment and didn‘t believe that he would really be there. But he was: Mubarak, his two sons Alaa and Gamal, ex-minister of interiour Habib Al-Adly and further supporters of their regime appeared today in court. In the early morning already several hundred people gathered in front of the huge screens outside the courtroom that was build in the police academy in New Cairo on the outskirts of Cairo. Fights broke out between Mubarak-supporters and others against him, they were fighting each other with sticks and stones, 43 people got injured. 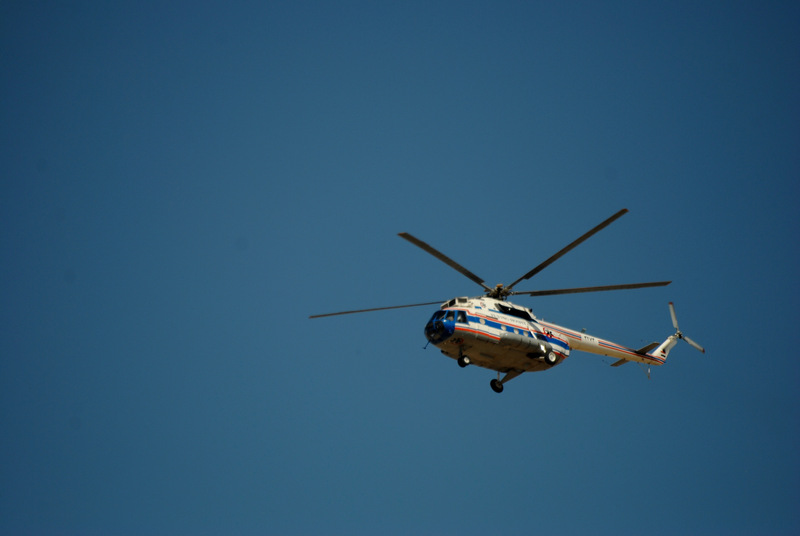 Then the helicopter with Mubarak arrived. When he was taken out, nothing could be seen. One day after brutally clearing the square of protesters, the army attackes again – on the eve the first day of the process against ex-president Hosni Mubarak. A small number of protesters gathered in the early evening at Tahrir Square, about 100 – 200. They were chanting slogans against the military and the eviction of the square. Thousands of soldiers and officers of riot-police CSF still were present at the square to secure nobody is blocking traffic or trying to enter the inner circle. The didn‘t wait for long: Around 9pm, the attacked the protesters violently. And not only them: The started arresting and beating everybody around, people started running trough the streets to get away from the square, police and military following them, randomly arresting people in streets and cafe-shops. At 3 pm several tanks entered the streets around Tahrir, a few minutes later the went in, thousands of soldiers attacked the remaining camps in the centre of the square and beside the Mogamma, supported by the riot police CSF. With them were a lot of people in civil clothes, maybe thugs but more probably police in civil clothes. They pulled down all the tents, beat people badly, arrested many – more information will be out soon. After half an hour the soldiers opened the square for the traffic. Passing cars were cheering at them, the owners of the shops nearbywho already tried to open one gate of the square yesterday were shouting „people and army – one hand“. Al-Jazeera was fast in arriving and broadcasted the attack live, kikhote took a good video from a building beside the square, now there also videos been uploaded from ppl who have been on the square during the attack. Update (11pm): SCAF speaks of 111 arrested „thugs“. Lawyers have contact with the arrested protesters, they have been beaten up badly, are now at C28 with military police. Even though many of them had been fasting the whole day they didn‘t get even water, when they finally got some it was very dirty. Lawyers and supporters now try to find out where they exactly are. 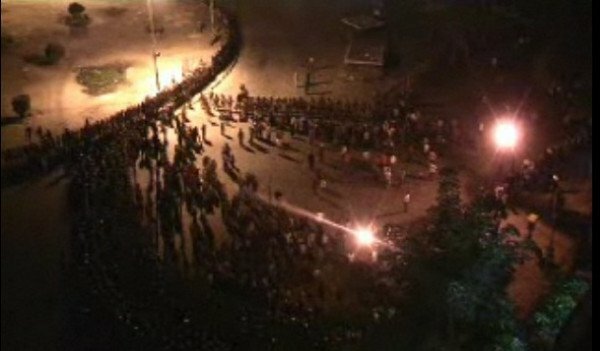 Update (aug2, 1:40am): Small march against SCAF and clearing of the square right now on Tahrir square. Watch live here. About 200 protesters now surrounded by more than 1000 soldiers and riot police CSF, chanting, clapping. Circle getting closer. Everybody who tries to go out is being arrested. Du browst gerade in den Egyptian Spring Weblog-Archiven nach dem Monat August 2011.